Middle States Physical Education Teach, Robyn Adams, recently took advantage of the perks offered through the USTA’s Net Generation youth tennis brand and her students enjoyed the benefits! We’ve built turnkey lesson plans, created in conjunction with SHAPE (Society of Health and Physical Educators), to give everyone the tools to teach tennis. Plus with the Net Generation Mobile App, you have access to those tools wherever you are. You’ve got what it takes to teach tennis. Now get what it takes to teach tennis. Partner with a local coach or organization and receive free equipment like a roller bag, youth racquets and red-level balls, along with chalk and tape to make nets and draw courts. You’ll also receive a printed version of the schools curriculum. 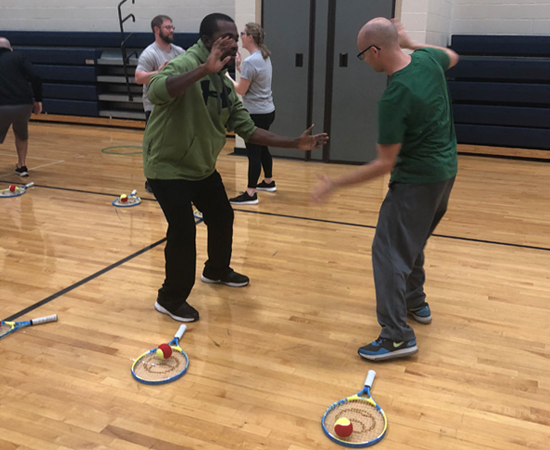 The workshop is an interactive, three-hour training for your school district that provides and teaches the tools needed to begin tennis in your PE classes. Ready to begin? Have any questions? Email schools@ms.usta.com to learn more about bringing tennis to your school and to take advantage of the USTA's schools promotion. Or, fill out our simple form to have someone contact you or your school contact about the Net Generation Schools Initiative.